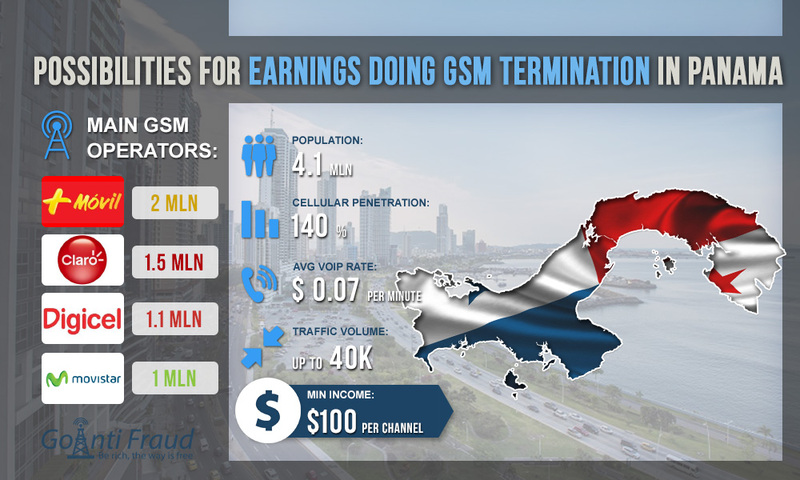 Panama refers to Latin American countries that are considered promising for investments in the GSM termination industry. In this direction, the average sip voip call rates are about $0.07 per minute. The mobile sector is actively developing. In 2017, the country had more than 5.64 million cellular connections, as well as the mobile penetration was 72%, with a population of 4.1 million people. This is one of the highest indicators in the region. All operators provide good coverage throughout the country but in some remote areas of Panama, there is no signal. The country's mobile sector is very competitive. Earlier in the market, there was a duopoly of two operators - Cable & Wireless (+ Movil now) and Movistar. The cellular communication has been booming. There was additional competition, which led to a decrease in on calls. SIM-cards are sold even through vending machines, for example, at airports. So you do not have to show documents when you buy SIM-cards. On average, a new starter package in Panama costs about $1. Cellular communication is inexpensive. Accordingly, the terminator can make $100 via one channel, using even a minimal set of GoIP equipment.